THE trust has launched a new campaign to help prevent patients being given too much oxygen. 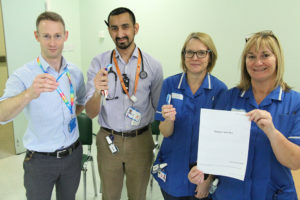 The respiratory team are now educating patients at high risk of harm from being given too much oxygen (those with chronic hypercapnea) by providing nurse education, a patient information sheet about oxygen, and a new medical alert key fob which patients can carry with them. This is as well as getting a standard British Thoracic Society national alert card. Respiratory consultant Ben Prudon said: “We have been continuing to look at ways to improve in-hospital oxygen prescribing to prevent patient harm from over-oxygenation. “As part of this work, we have launched this awareness campaign to highlight both to patients and other health staff what the risks of having too much oxygen can be.